To add an image from your computer, you can either click on the Select Files button or drag the media inside the big dotted square. The uploader will now show you a thumbnail (small, cropped version) of the image you uploaded. Enter a title for your image as well as a caption and a description. Depending on the way your website has been developed, the caption and/or description may appear below the image on your page. Entering a title and caption for each image will help your webpage become more visible to search engines like Google and Yahoo! If you want the image to link to another page, enter a URL in the Link URL field. You can also use the File URL button to have image link to itself (which will display the image on its own page) or the Post URL button to have the image link back to the same page we are already on. This may help people find your webpage who are searching the internet using an image search tool like Google Images for example. The alignment setting allows you to align the image to the left of the text, in the center or to the right. Any of these settings will force the text to wrap around the image. A setting of none will place the image on its own line and the text will appear above and below it but not next to it. The size of the image can also be set by choosing thumbnail, medium, large or full size. Be aware that choosing thumbnail may crop your image and display the center of your image so you may lose information towards the edges. The image will appear on your website very similar to the thumbnail that appears on this very screen. When you are happy with your settings, click on the Insert into Post button to insert the image into your page. 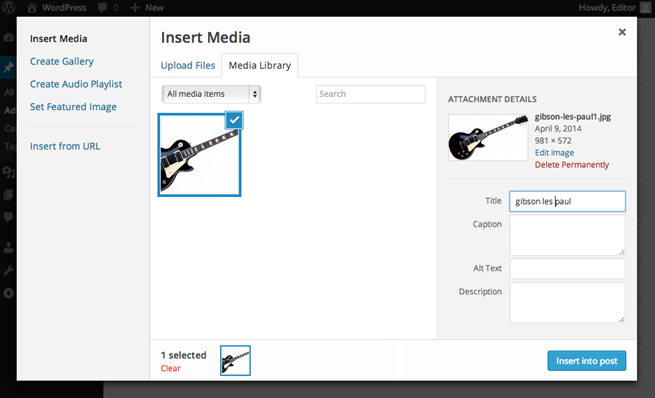 Hint: The Add Media functionality is identical for adding media to a page or a post.